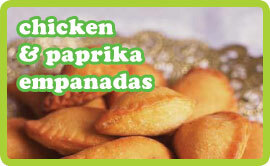 If you make these you’ll agree that you can never have too many empanadas on the table. I made these in advance for a party next week so haven’t eaten one yet. I did eat quite a bit of the filling though which left me short of four empanadas for my guests. Meanwhile, to make the filling heat the oil in a frying pan over a medium heat. Gently fry the onions and garlic for 5 minutes until soft. Add the chicken and fry, breaking up any lumps that form for 4 minutes. Add the tarragon and paprika and stir then add the red wine, let it sizzle then add the tomato puree and tomatoes and stir well. Let this simmer for 5 minutes until thick. Remove from the heat, season with salt & pepper and stir through the parsley. If you’re cooking them right away, preheat the oven to 190ºC. Lightly oil a baking sheet and using the remaining eggs, beaten, brush each empanada before baking in the oven for 30 minutes until golden. You can also cook from frozen – just reduce the oven temperature to 180ºC and add 10-15 minutes to the cooking time – being careful not to burn them.